The SmartSkin Laser is a state of the art skin resurfacing system that is unique in that it can be used to treat your skin without affecting surrounding healthy tissue. Better than Fraxel, this advanced microablative technology allows your skin to heal in a fraction of the time because we are not ablating the entire skin surface all at once. Over the years signs of aging appear as a result of exposure to the sun (photo aging) and the effects of gravity and natural aging. The texture, tone, and pigmentation of your skin can be affected, often resulting in unwanted wrinkles and fine lines, sun spots and larger pores. This look of premature aging can negatively impact how we feel about our appearance and how we are perceived by others. The good news is that new advancements in laser technology provide a means of rejuvenating and restoring your skin to a more youthful, smoother look, and even sometimes eliminate the need for surgical corrections like blepharoplasty (eyelid surgery). Why Choose SmartSkin C02 over Fraxel or "other" resurfacing Procedure? Prior to SmartSkin laser treatments, there were two types of laser treatment options available- fully ablative and non-ablative treatments like fraxel. 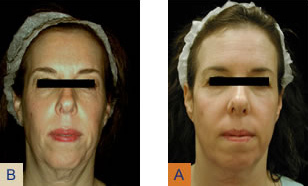 Fully ablative lasers treatments require the treatment of the entire layer of skin at very high temperatures. Although this method is very effective it also produces more side effects, bleeding and long periods of healing. Although non-ablative laser treatments are safer, they required many more treatments with downtime and unreliable results. Smartskin Laser treatments are the best of both worlds. In an attempt to leverage the performance of CO2 ablative technology while minimizing downtime, micro ablative lasers like Smartskin were developed. Micro ablative technology removes only a fraction of the photodamaged skin at any one treatment session, leaving intact skin in between the zones of damage. Since only a portion of the skin is treated, the therapy leads to excellent outcomes. You and your clinician will carefully determine the best course of treatment based on your cosmetic and downtime expectations as well as the area being treated. You may opt for 3 or 4 sessions with minimal downtime. Or if you're able to take a longer downtime, experience dramatic results in just 1 or 2 treatments. The entire face can be treated in as little as 15-30 minutes, with results lasting years, with proper skin care and protection. Clients receiving Smartskin Laser treatment generally notice results immediately that progressively improve. Optimal results are usually experienced within two to three months. Remember your skin needs time to heal and replace the damaged tissue with new collagen and elastin, along with new and healthy skin cells. 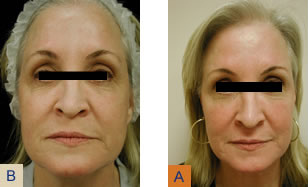 Fillers, Thermage, Botox, Obagi and Vivite all enhance the look of your new younger face. Often these are good maintenance treatments which help to remodel collagen. Your clinician may suggest other maintenance skincare regimens to keep your skin cells regularly turning over and your complexion glowing. Over time, collagen will regenerate and restore the supporting structure of your skin. You will be given a post-treatment kit and instructions for care. Following treatment it is extremely important to treat your skin gently and avoid direct sun exposure. Your newly emerged skin is very sensitive and must be treated gently during healing. Because SmartSkin CO2 has the distinct ability to deliver micro pulses of energy, you will experience a significantly shorter recovery time than with fully ablative lasers. Each tiny hole will quickly heal and within a few days you will be able to apply makeup on the treated surface and return to your normal lifestyle. You and your clinician may choose a more aggressive treatment regimen for more significant results with a downtime of three to five days with just one treatment. Can I get a MRSA infection from Smartskin? NO. Taken from Guidelines for the Control of MRSA by The association for Professionals in Infection Control & Epidemiology, Inc. – Greater Omaha Area, states "MRSA is spread from person-to-person by direct contact." Only MRSA infected or colonized individuals can transmit MRSA. Clinicians at Radiance Medspa tested negative for MRSA. Following post treatment care carefully will minimize your risk of any bacterial transmission to the treated area.